512 people in our community are currently praying with you. That evening Jesus� disciples went down to the shore to wait for him. But as darkness fell and Jesus still hadn�t come back, they got into the boat and headed across the lake toward Capernaum. Soon a gale swept down upon them, and the sea grew very rough. They had rowed three or four miles when suddenly they saw Jesus walking on the water toward the boat. They were terrified, but he called out to them, �Don�t be afraid. 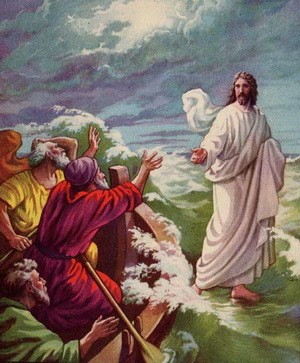 I am here.� Then they were eager to let him in the boat, and they quickly arrived at their destination. The first sentence is a transition from the feeding of the 5,000. The people who witnessed it became understandably excited; they were ready to proclaim Jesus the King of Israel, which would have started a political revolution, at the least against Herod and most likely against Rome. This is exactly the kind of "savior" whom the Jews were anticipating. But as we know, Jesus had other plans entirely. He did not plan to rule on earth. Just the opposite: he planned to live and die as a humble commoner. He would never raise a sword against the Romans or the ruling parties of Judea. Instead, he would die like a criminal for an unjust accusation. Christ's walking on water is one of the iconic moments of his life. Every Western atheist knows about it. I imagine walking on water comes in second only to St. Peter letting people into heaven as a setup for jokes with religious characters. It is probably a good exercise to ask yourself whether you actually believe that Christ, literally and physically, crossed the open water of Lake Tiberius (another name for the Sea of Galilee) during a fierce storm. Whatever you think about it, it is a good starting point for someone to meditate on his or her beliefs about Christ and salvation.